Tigerair CEO Rob Sharp has made it clear that “primarily demand and commercial viability of a route” were the factors which motivated the airline to cease flying to Alice Springs from Sydney and Melbourne on July 21. “With the significant effort we put into promoting our Alice Springs services, we did see some stimulation of the market in the leisure and budget segments however one year on, our desire to meet the anticipated level of consumer demand on these two services has not been realised,” he said. “Despite our best efforts to promote our services to and from Alice Springs, demand simply isn’t enough to sustain our services on these routes. “Our decision to withdraw services to Alice Springs is essentially about overall commercial viability of the routes to and from Alice Springs and over the past year we can confirm that it is not commercially viable to sustainably continue these services. Asked whether the marketing agreement with Tourism NT, into which the NT Government funneled about $1m, was tied to an undertaking to fly the routes for an agreed time, Mr Sharp said: “Arrangements we have in place with our airport and tourism partners are commercially confidential. Is Tiger gone for good? Says Mr Sharp: “We do see this as an indefinite withdrawal of services to and from Alice Springs. However, as always, we will continue to monitor the situation and if we witness the right conditions and level of demand we will consider reinstating or launching new services to Alice Springs. Tourism Minister Matt Conlan released a statement about cheap flights offered by Qantas later this year and referred to a $7m cooperative agreement with the airline. However, he did not answer the following questions: What will the Qantas fares be after December 10? What were they before Tiger resumed flights last year? Where can I find details of the cooperative agreement? Tiger will also stop flights between Melbourne and the Sunshine Coast but has doubled its services between Sydney and the Gold Coast. 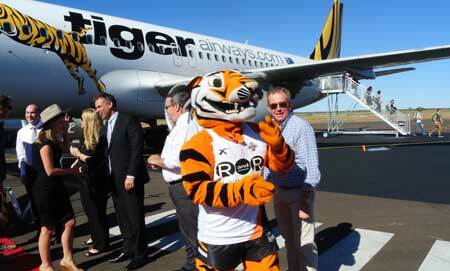 PHOTO: The resumption of Tiger flights was celebrated with grand hoopla in April last year. Just bad business, guys, it is so simple put your prices up. Pax will pay $150 upwards. I have been on tiger eight times always 70% full if not more.